I want to talk about mental health. Too often, we don’t discuss it. There’s so much stigma associated with it that I don’t even know where to start. In so many ways, my cancer has been easier to talk about. Cancer is something that has been gaining attention over the years. There are fundraisers, there are runs, there is media attention and research is being funded. Cancer is something “tangible” and “real”. There are cells that are malignant, we seem to accept this fact fairly easily. Consequently, it is easier to segue from talking about cancer into talking about mental health. 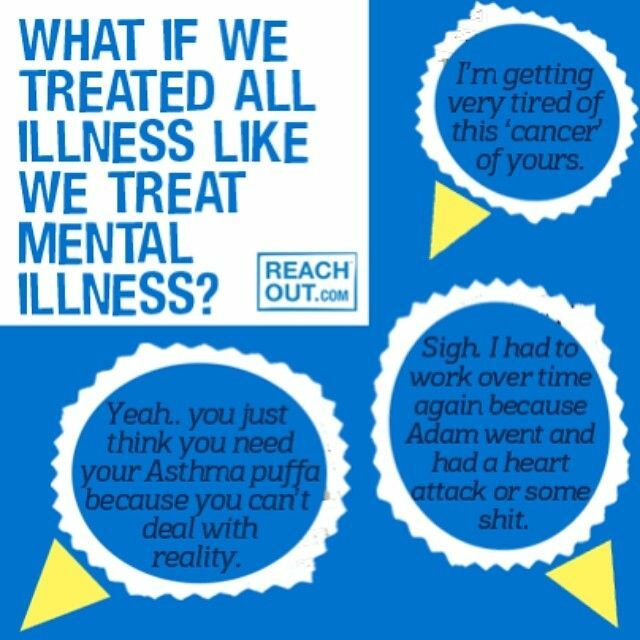 Because someone would have to have very little empathy and tact to tell a cancer patient that being depressed is “not a real thing”. Well today, I’m going to make the bold statement, that it is NEVER okay to undermine or belittle mental health. Even when someone doesn’t have cancer. Sometimes, there are social and external factors involved but, there can also be chemical processes involved. I cannot emphasize enough how important it is to educate yourself about mental health and get the facts. Just like my thyroid cancer is one aspect of cancer, depression is one aspect of mental health. Our emotional well-being – how we think, feel and behave is important. It can affect how we function and behave with other people. 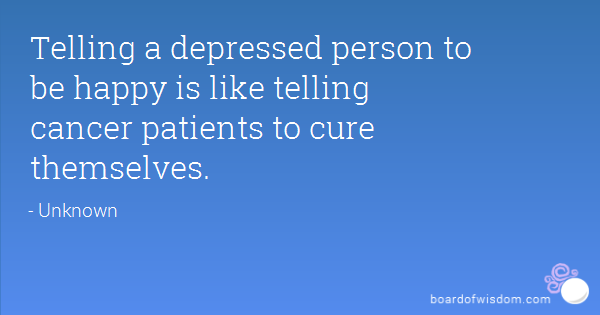 Just like there isn’t a universal cure for cancer, there isn’t a cure for depression. This is why it saddens and frustrates me when myths are perpetuated and when the impact of mental health is undermined. This statement only serves to make people feel guilty if this prescription does not work for them. It is also an easy way to dismiss those who have not been “cured” by following these steps as not having a strong enough faith. Prayer can help but if it does not work, that doesn’t mean the person does not have faith or does not believe in it sincerely. This post is harmful because it perpetuates the stigma of depression and almost encourages discrimination, especially among the Muslim community. This is an especially important point to clarify because Bilal Phillips is a Islamic scholar with credibility among the Muslim community. On Facebook alone, he has over 2 million people who like and follow his page. I have cancer. I am extremely thankful for all the collective prayers for me but I am not going to say ‘no’ to the medication, ‘no’ to surgery and rely only on prayer to cure my cancer. Cancer is a medical and legitimate health concern. Depression is a medical and legitimate health concern. It is not helpful to perpetuate this idea that a “prophetic formula” alone will absolutely solve depression. Sometimes, psychotherapy is necessary. Sometimes, medication is necessary. And if necessary people need to be able to reach out for this help. Most importantly, people need to not be judged. Perhaps what the post was getting at was sadness, which is distinctly different from depression. But it is exactly this type of misunderstanding that perpetuates myths. We start to think it is not as big a deal and that people can just snap out of it. If only their faith was stronger. If only they prayed more. They have lost their path with their creator. That sort of thinking does not help. This issue is important to me because I have personal experience with mental health issues, even before my cancer diagnosis. I started sharing my journey after my cancer diagnosis, but please do not misinterpret this as my first encounter with hardship, health-related or otherwise. Where else would the inspiration for my book ,Dancing in the Rain, have come from? Like many, I have also faced challenges in silence. There is also a familial obligation that comes with the disclosure of issues and sharing experiences. The Sri Lankan, Muslim community is a tight-knit one, both in Sri Lanka and in Canada. This has wonderful up-sides and this also means that news travels fast. I have had to consider my family and so I was also someone who kept silent about family issues as well as my own personal health issues. We do not hang out our dirty laundry for everyone to see. There is the issue of “saving face”. I do not think that the particular culture I come from is the only one where these concerns exist. Perhaps many others can also relate to this. Sharing my news about cancer has resulted in a community coming together to pray and support me. Would this be the same for a mental health issue? Of course, not everything needs to be shared. And there are different levels of sharing. For instance, if someone needs help, I would hope they can share this with someone who can support them and if needed, direct them to appropriate resources. When someone feels that they cannot speak up or confide in someone because of how people will perceive the information, because of what might be said about their family, their faith, their character – there is something truly sad about that. This is why I say that cancer was, in many ways, the easiest issue to start talking about. But even with cancer, many people choose not to share the information. And that is absolutely their choice. But the key word here is “choice”. If it is socially imposed that they not share, then that choice is taken away. I do not know how or when we will get to a place where it is okay for people to be themselves, to feel like they do not have to battle invisible illnesses in silence. We are not there yet. All I know is that I am not alone. And that gives me courage enough to post this. This was a great reality check for an issue that many people are too afraid to talk about because its a taboo. I know friends who are going through this so I’ve shared it and I hope you won’t mind. I believe this blog will really help them because someone else is able to understand how they feel as so few people are really able to. More people need to try to understand that mental illness is real. I also come from a culture where we try to save face and so do my friends going through this- its a shame, but its a great step forward when you have come out and bravely talked about it. Share, share and together, maybe we create a little bit of change. I found myself nodding throughout this post and thinking to myself: “Yes! Yes! Yes!”. You are very right about all of this. Sadly, many people I have spoken to in the past have dismissed the idea of talking to therapists and/or psychiatrists. There are so many benefits to doing so, though. Faith is obviously important to have; but even so, action on our part is absolutely necessary too. Anyway, I’m thinking of you and praying for you now more than ever. You inspire me. You’re amazing. Stay strong! Depression IS a medical and legitimate health concern and people need to wake up to this fact. They need to understand and accept it and provide care and empathy even more than the other ‘acceptable’ diagnoses. You’ve made a great start on this long road, and I’m so proud of you! I really appreciate your comment – especially on this post. I’m very fortunate that I’m now in a place where I can start to talk about these issues.